Is the Bible silent on sorcery? If not, then what does the Bible say about sorcery? The definition of sorcery is the use of power gained from the control or authority of evil spirits or demons that are used to inflict harm, deceive others, or divine something. Sorcery can include the power to control the forces of nature or someone else by use of supernatural powers. Some would define it as the ability to control nature or people using witchcraft or magic. The Bible is most certainly not silent about sorcery and there is clear evidence that it is one of the greatest evils mentioned in the Bible. The Greek word used for the word “sorcery” in the New Testament might surprise you; it is “pharmakeia” from which we get our word “pharmacy” from. What do you find in pharmacies? Drugs and lots of them! The word sorcery is from pharmakeia and the first primary use of the word in Greek means “the use or the administering of drugs” so sorcery can absolutely mean the use of drugs but this can refer to illegal drugs and even the abuse or misuse of legally prescribed drugs. Since alcohol is a drug, could alcohol be implicated? Certainly we know drunkenness is sin. Many in the drug culture of the 1970’s used drugs to “expand their minds” or to “meditate” and this meditation or “expanding” allowed an open door for evil spirits or demons to come in, thus the secondary meaning of the Greek word “pharmakeia” is “sorcery, magic,” or “deceptions” which is what mind-altering drugs often do or open the door for. I am not talking about legally prescribed drugs but these too can be abused and misused just as illegal drugs can be. In Galatians chapter five, Paul mentions the fruits of the Spirit like “love, joy, peace, patience, kindness, goodness, faithfulness, gentleness [and]self-control” (Gal 5:22-23a) but in this same chapter he mentions the fruits or works of the flesh like “sexual immorality, impurity, sensuality, idolatry, sorcery, enmity, strife, jealousy, fits of anger, rivalries, dissensions, divisions, envy, drunkenness [and] orgies” (Gal 5:19-21a). Did you notice that sorcery is listed alongside of sexual immorality, drunkenness, and orgies? That is what God thinks about sorcery, considering it very much like these other despicable and abominable sins. It’s in the same class as those things that people who are headed for the lake of fire are doing (Rev 21:8) so clearly, it is something that should be avoided at all costs and repented of at once. Paul was very serious about these things as he concluded this list by writing “I warn you, as I warned you before, that those who do such things will not inherit the kingdom of God” (Gal 5:21b). The word “sorcery” used in Revelation 21:8 is again from the Greek word “pharmakeia” so it can mean drug abuse coupled with magic or witchcraft with a demonic or evil spirit being the source of power and this shouldn’t be surprising since these two often go together. 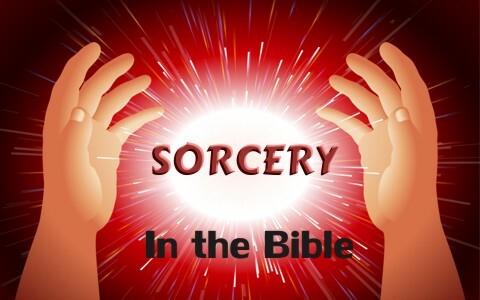 The word sorcery in the Old Testament is from the Hebrew word “kashaph” which means “to practice” or “use witchcraft” so it is no less sinful than it is in the New Testament. The use of sorcery comes up during the reign in one of the most evil kings in Israel’s history, King Manasseh. He was so far from God at one time that “he burned his sons as an offering in the Valley of the Son of Hinnom, and used fortune-telling and omens and sorcery, and dealt with mediums and with necromancers. He did much evil in the sight of the Lord, provoking him to anger. And the carved image of the idol that he had made he set in the house of God” (2 Chron 33:6-7). Could anyone reach a more despicable state of false religion than to actually make burnt offerings of your own sons!? It seems incredible that a king of Israel would go so far but that’s what evil influences do and you can most certainly attribute this form of pagan worship to the Devil and his demons. It is no wonder then that the Lord was provoked to anger. King Manasseh went so far as to set up an idol in the temple! When a person slides into such wickedness, it seems that there is no end to what evil can be done. God does not go lightly on those who practice sorcery at it says in Malachi 3:5 “Then I will draw near to you for judgment. I will be a swift witness against the sorcerers.” Revelation 21:8 tells the ultimate fate of all evil doers who refuse to repent like sorcerers “But as for the cowardly, the faithless, the detestable, as for murderers, the sexually immoral, sorcerers, idolaters, and all liars, their portion will be in the lake that burns with fire and sulfur, which is the second death.” In the coming New Jerusalem, “Outside are the dogs and sorcerers and the sexually immoral and murderers and idolaters, and everyone who loves and practices falsehood” (Rev 22:15). Sorcery is no grey area matter when it comes to the Bible. It is clearly sin and those who practice such things without repenting will absolutely be eternally separated from God and cast into the lake of fire with no hope of repentance and forgiveness ever again. God condemns such things and the use, or better yet, the abuse of illegal drugs (controlled substances) and the misuse or abuse of even prescription drugs must be repented of (turned away from and forsaken) because it is a gateway to the wicked spirits of darkness and those who participate in and practice such things, as Paul wrote, “will not inherit the kingdom of God” (Gal 5:21b). Related reading for you: Can People Communicate with the Dead? Thank you so much Tynesha. Amen. Those who practice sorcery follow their father the evil one. Learn the modus operandi. From one of the very Best Biblical Apologists, Kjos Ministries. In this crucial time in history as evil is disguised as good we need brave true Christians to speak up. Each of us are challenged to be the man or woman Christ Jesus would have us be. The charts are excellent contrasts presented in Scripture. People think smoking pot is harmless but it is sorcery. You are casting a spell over yourself. Practicing witchcraft. It is the willful decision to leave the reality of God to choose a different reality. One without God. This is turning your back on God and saying no to Him. When we do that we are walking toward hell.